I’ve been away for a couple of days and have lots to write about. Yogamum tagged me for a meme that I have to get to, and I have cute photos of Jasper swimming for the first time, as we went up to the cottage to celebrate Maya’s 11 birthday. But that all has to wait just a bit so I can tell you of our excitement last night. After dinner, Maya was heading out to do her paper route, but after she walked out the door, she turned around and walked right back in. She said, “There’s a cop next door and he told me to go inside.” Then she panicked because my response to this was to go right outside to see what was going on. 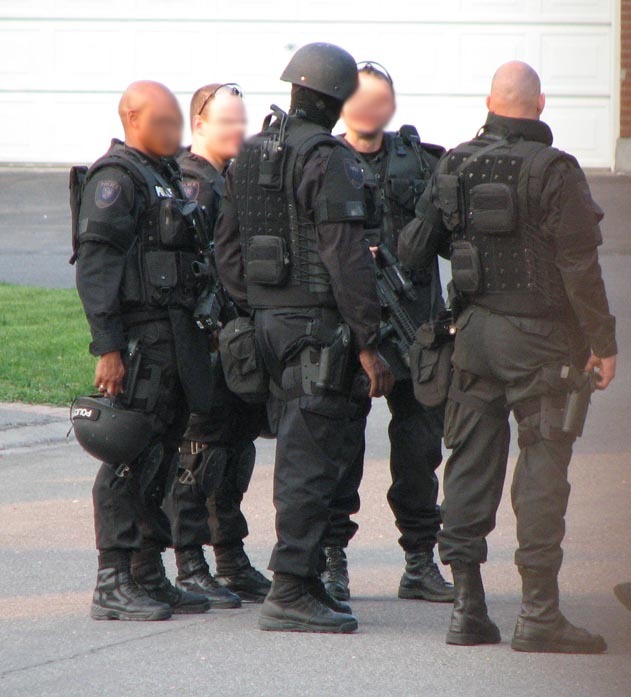 What I saw was an entire SWAT team – although I think they are actually called a Tactical Team – in full gear and big guns, coming out of our neighbour’s house. That was cool. They didn’t seem to mind me being out – I think they just maybe didn’t want a kid out alone, or maybe it was because they’d discovered their quarry wasn’t at home. Either way, we all came out to watch the fun. As we watched, car after unmarked car pulled up (8 in total), and out came more cops, these ones clearly undercover guys, in regular clothes and all scruffy, putting on police vests as they got out of their cars. So the neighbour and I and our sons went over to the cop, who showed us his pepper spray, handcuffs, collapsible stick for whacking people. He even showed us his extra magazine for the gun (the bullets were surprisingly big). He said to the boys, “When you grow up, you can have something like this too if you become a police officer. It’s the greatest job in the world.” His enthusiasm and friendliness was really quite sweet. Then he told us he was with the drug unit, and I said, “Yeah, we kind of knew that.” He rubbed his stubble and said, “I guess this gives it away, huh?” But that wasn’t it at all. The reason we knew that is that everyone in our neighbourhood ‘knows’ that the guy in that house is a drug dealer. When I say we ‘know’ that, I mean it is a persistent rumour, fueled by the fact that the guy has no obvious job and men in vans and beat-up cars come to the house constantly. I have no idea how it started. All I know is that when we first moved here, a couple of neighbours informed us. One did so in a way to suggest that he’s a very scary man, but he isn’t. He’s the one I mentioned in my last post, who gives us his excess cucumbers. When my cats appeared to be using one portion of his garden for a litter box, he was very nice about telling me so, as opposed to the anonymous neighbor who called bylaw on us. Maybe he is a drug dealer. If so, what he does for a living is bad, but I have seen no proof and he is a good neighbour, so we remain friendly. But it means that we weren’t completely surprised when the police tactical team showed up. The only awkward thing was that Maya was still terrified. Asher wasn’t, but he was still full of questions. Playing dumb but providing reassurances did nothing for Maya, so I finally told her that they suspected him of dealing drugs, stressing that we have no idea if they have any proof at all and he’s still a perfectly nice neighbour. It lead to an interesting conversation with the kids about the legal system, how just because they arrest people that doesn’t mean they are guilty of a crime, how people get out on bail, about how the police are allowed to search houses (they were a bit appalled that the cops could flip the bed and strip it, then just leave it leaning up against the window without tidying up the mess they made). It also allowed me to get in a bit of a discussion about illegal drugs with Maya, which I’ve been looking to do for a while. Did I mention it was an interesting evening? Anyway, I took a couple photos on the sly, then my neighbour took my camera and took a couple more right out there in the open. To my surprise, the cops had no problem with him pointing a camera right at them. Here’s one of the tactical team, just to prove I’m not making the whole thing up. I don’t know how to do the traditional sort of blur photos usually have when you want to disguise someone’s identity, but I did manage blur out identifiable faces. Even if they didn’t complain about having their photos taken, it seems sort of unfair to show them here. Check out the huge gun the guy in the middle is holding. Asher was so impressed.